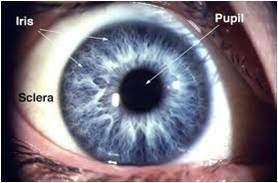 The iris is a colored ring that surrounds the pupil and contains easily visible yet complex and distinct combinations of corona, pits, filaments, crypts, striations, radial furrows, and more. The iris is called the Living Password because of its unique, random features. It's always with you and can't be stolen or faked. As such, it makes an excellent biometric identifier. The world is crying out for simpler access controls to personal authentication systems and it looks like biometrics may be the answer. Instead of that big ring of keys, all those access cards or passwords you carry around with you, your body can be used to uniquely identify you. Furthermore, when biometrics measures are applied in combination with other controls, such as access cards or passwords, the reliability of authentication controls takes a giant step forward. Biometrics is best defined as measurable physiological and / or behavioral characteristics that can be utilized to verify the identity of an individual. Initially, these techniques were employed primarily in specialist high security applications; however we are now seeing their use and proposed use in a much broader range of public facing situations. Used properly, biometrics can offer effective ways to safeguard properties and people, data, and information, in an unobtrusive manner. ü Highly protected, internal organ of the eye. ü Iris patterns possess a high degree of randomness. ü Entropy: 3.2 bits per square-millimeter. ü Uniqueness: set by combinatorial complexity. ü Patterns apparently stable throughout life. ü The odds of two different irises returning identical scans: 1 in 1078. 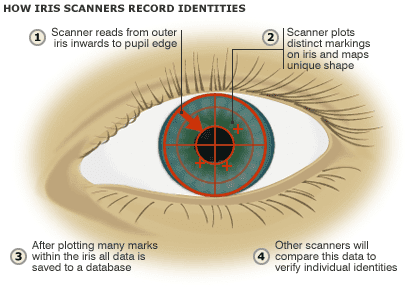 In Iris scanning, the eye is illuminated by light-emitting diodes that surround the camera. The diodes emit in the visible light spectrum. The scanner is NOT a laser-retinal scanner so there are no laser eye hazards. Iris identification uses standard video cameras — the same kind you would use to videotape your family — to take a picture of the iris of your eye. Since it does not use lasers, it has none of the inherent risks associated with lasers. The LEDs used nullify the effects of the environment. The iris-scanning procedure, as used on humans, is simple and painless. 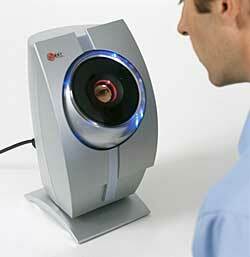 A person must stand approximately 12-14 inches from a camera and looks into the scanning device. The camera scans the iris. The scanned pattern is then compared to previously recorded patterns. Identification is achieved in two seconds and verification in three.